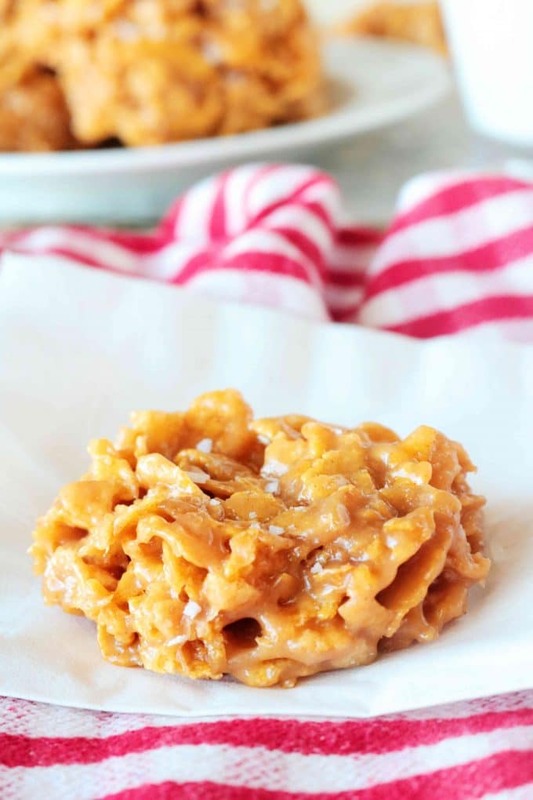 Easy Cornflake Cookies with Peanut Butter are a salty-sweet vintage treat that lies somewhere between a cookie and candy. 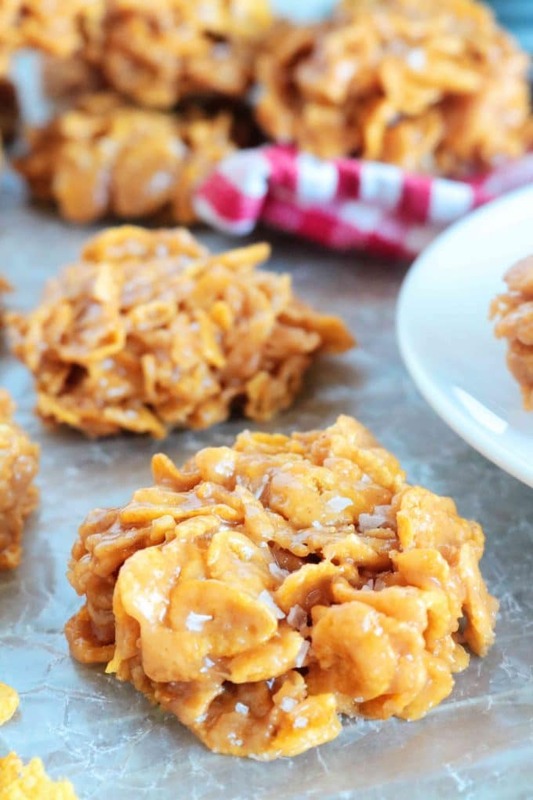 These delicious little cereal clusters are coated in a peanut buttery sugar mixture. The candy-coating becomes soft and chewy once set, and it is the perfect contrast to crispy, crunchy Cornflakes! They are an easy, no-bake treat, consisting of 4 ingredients, and coming together with less than 15 minutes of prep. 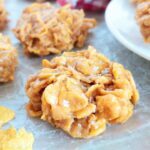 Cornflakes are the obvious ingredient in Cornflake Cookies. But, in addition to Cornflakes, what gives this classic cookie its salty-sweet, candy-like vibe? 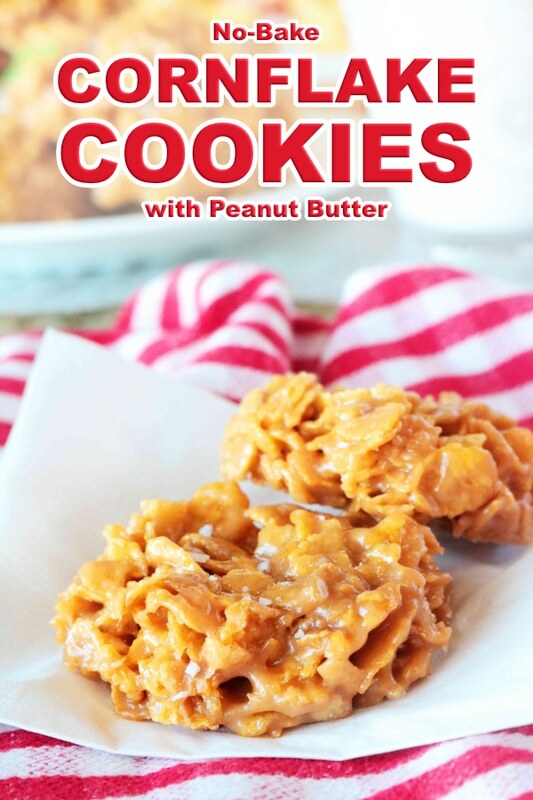 Peanut Butter serves as more than just a flavor agent for these Cornflake Cookies. Be sure to use the good old-fashioned peanut butter. Nothing crunchy, and definitely not the healthy stuff. Save that for the PB&J’s. The sugar mixture consists of both granulated sugar and light corn syrup. If you only have dark corn syrup, technically, you could sub it in, however — you’ll be changing the overall flavor profile of the cookie. So on second thought, maybe not. Light and dark corn syrup are interchangeable in recipes, but they don’t exactly have the same flavor profile. Dark corn syrup has more of a molasses flavor profile, while light corn syrup boasts much more vanilla. When it comes to brown sugar vs. granulated sugar, the same could be said. The darker the sugar, the more molasses flavor it will yield. So, moral of the story — stick with granulated sugar and light corn syrup for this recipe. Measure out Cornflakes and place in large mixing bowl. Have work surface ready with wax paper. Bring sugar and corn syrup to a boil. Remove from the heat. Stir in peanut butter and salt, and pour over Cornflakes. Stir to coat. Drop heaping tablespoons of the mixture across your work surface and allow to cool. Cornflake Cookies come together fast, which means you’ll want to have your Cornflakes measured and your work surface prepped before you begin. When it comes to Cornflake Cookies, watch the sugar, and not just because it is boiling lava hot. Keep in mind, the process for making these little cuties is actually closer to candy-making than cookie baking. And, when it comes to making candy, nothing matters more than the temperature of the sugar. 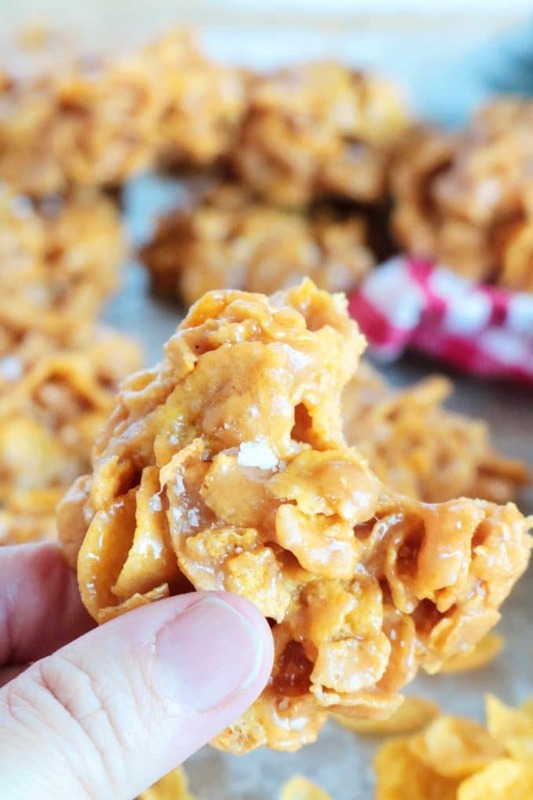 For this breezy recipe, don’t worry about getting out the candy thermometer, however, you do want to pay attention to what’s happening in the saucepan. If the sugar doesn’t get hot enough, your cookies will likely not hold together. If your sugar gets too hot, your cookies will be overly dense and chewy. Rest assured, as long as you allow the sugar and corn syrup mixture to reach a boil and remove it from the heat shortly thereafter, your Cornflake Cookies are going to be just fine. Once your sugar mixture is off the heat, stir in your peanut butter and salt. Take care when adding the peanut butter to the saucepan to avoid any splattering. Stir until the mixture looks smooth, and then you will pour it over the Cornflakes. Very gently stir until all of the Cornflakes are coated, and if you know how to “fold” batter, this is an excellent technique to implement here. The goal is to not crush the Cornflakes with your stirring spoon. 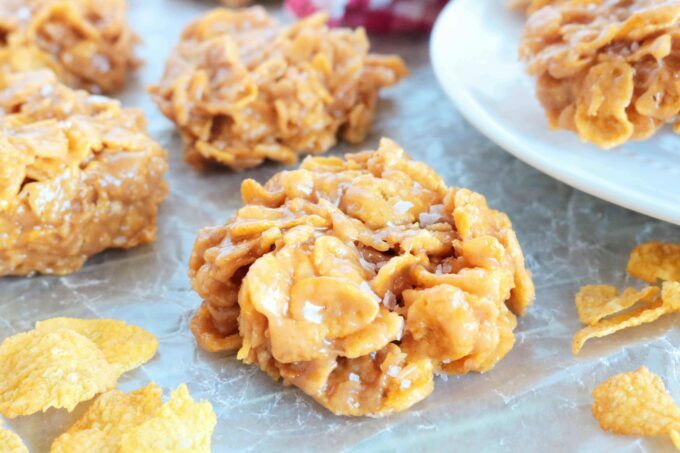 The last step is to scoop the Cornflake Cookies and allow them to set on the prepared wax paper. I like to use a large cookie scoop for uniformly shaped clusters. Then, sprinkle the tops of the cookies with a generous pinch of Kosher salt. If you happen to have Falk salt, it is absolutely perfect on these cookies. If you are making these cookies for the holidays, now would also be the time to hit them up with some colorful nonpareils or sprinkles. Cornflake Cookies do not need to be refrigerated and can be stored in a tightly sealed, airtight container at room temperature. Peanut Butter No-Bake Cookies are a classic no-bake dessert perfect for those who love a good salty-sweet combo. The base of the cookie comes together in less than 10 minutes on the stovetop and yields a praline-like texture, speckled with chewy, flavorful, old-fashioned oats. Reece’s No-Bake Peanut Butter Pie is a gorgeous, mile-high pie equipped with a creamy peanut butter filling and decadent bites of chopped Reece’s Peanut Butter Cups. The fluffy filling sits on top of an Oreo pie crust, and the whole shebang is finished with a cascade of dreamy whipped cream. Hershey Thumbprint Cookies are always a hit come Christmastime, and these peanut butter cookies with a chocolate Hershey Kiss inside are no exception. This recipe always yields a soft and chewy peanut butter cookie perfect for topping with a chocolate Hershey kiss! Peanut Butter Blondies are a salty-sweet dessert to savor with every single bite. Sink your teeth into one of these for a peanut buttery, melt in your mouth bar cookie. Peanut Butter Rice Krispie Treats feature gooey, stretchy marshmallow bars with great big peanut butter flavor! The perfect quick-fix treat for any and all occasions! Add Cornflakes to a large mixing bowl and set aside. 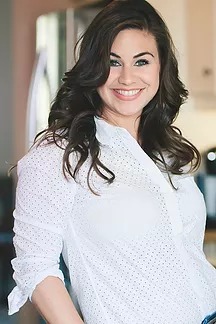 Have ready large sheets of wax paper laid out across your work surface. Add sugar and light corn syrup to a small or medium-sized saucepan (close to a 4-cup capacity is preferable). Bring to high heat and stir gently with a wooden spoon or spatula. Be very careful of spills and splatters -- sugar gets extremely hot. As soon as the mixture reaches a boil, remove it from the heat. Carefully, add the peanut butter and 1/2 teaspoon salt and stir until combined. Pour the mixture over the cereal and gently stir until all of the cereal is coated. Working quickly, scoop mounds (about 2 heaping tablespoons) of the mixture and set on the wax paper. Sprinkle with a generous pinch of Kosher or Falk salt and allow to cool and set, about 25 minutes. I’ve been making these for over 40 years now, and they;re still a favorite. My recipe never called for salt I guess this just gives me an excuse to make a batch, eh? Thanks for posting this! !